When Catherine Kehoe paints, she is stared at by a row of self-portraits. The face is stern, dour, severe, less a witness than a juror or judge. She wears red-framed eyeglasses, and her focus is so intense that she must be seeing what we cannot see. These are images of concentrated attention. You want to snap your fingers in front of her face to break the spell. Kehoe has said that her voice “within is loud and clear; it banishes all others from the studio.” These small but fierce self-portraits may be that voice in paint. Kehoe’s bare-bones studio is half the unheated attic of the Roslindale house she shares with her partner, the painter Nancy McCarthy. Three skylights admit north light; a small space heater gives warmth and lamps provide light for night-work. Her materials are what Kehoe requires and no more—two or three metal straight edges, a palette knife, several squared off, tapered sable bright brushes (she throws them away when they lose their edge) and a palette with colors ranged around its edges. Kehoe likes a full palette of Winsor & Newton and Williamsburg oil paints from which she mixes and derives the intense colors she currently favors. Scattered about are the toys, plates and pieces of cloth Kehoe uses as set-ups for her still lifes. To her left many of the still lifes in this show stand on a ledge. To her right are a series of ancestor portraits, drab in color, reflecting their origin in old, sepia-toned photographs. Across from the easel are the self-portraits. Kehoe surrounds herself with identity and history. The still lifes and self-portraits come from different impulses. At some recent point Kehoe began to end her painting day by starting a self-portrait. After working several hours on a still life to the point of feeling an “utter failure,” she allowed herself to “just fool around.” “What,” she thought, “have I got to lose?” She relaxed into self-portraiture, unclenched her grip, loosened control and looked into a mirror without thinking about herself. Today Kehoe sees the self-portraits as “not about me.” It’s the same woman, different clothes. And autobiography, presentation of an inner self, does not seem to have been her intention. She has sought a barely conscious vantage point, wanting to see for the sake of seeing and perhaps catch in action, unawares, the face of the determined, wholly absorbed painter Kehoe is. She works quickly on the self-portraits, free from painstaking effort — a still life commonly takes her a month or more to complete. And she applies her paint differently. The surface is edges, and blocks, or near-blocks of color, as if she used a palette knife. These strokes are the work of her sable bright brushes taking advantage of their ability to make a line. Her paint handling emphasizes the intensity of expression while suggesting that the face for a painter can be a sort of carpenter’s problem. You need a mirror to remind you of its planes and structure. Kehoe looks hard and then stops looking to leave her self-portrait unfinished. Her mornings begin with final touches. Perhaps she needs to start her day confident of having finished a painting, or she simply needs to warm up. That done Kehoe, bends to her current set-up. In her still-life paintings, the subject is what paint can do to make images happen, bring them alive to our imaginations. Flowers, the lilies and ranunculus in a water glass, are the subject in so far as they are forms, but Kehoe is not, as the variety of her set-ups show, a painter of flowers. On her lively blog—all interested in her work and what her eyes are on at present, plus other oddments and pleasures, ought to go there forthwith —Kehoe quotes Degas, one of her touchstone painters: “Painting is the ability to surround Venetian red so that it looks like vermillion.” Kehoe’s interest in color is an engine that drives her still-life painting; it is not her subject. Color is nuance and so is light, and so too is the way the paint is applied, and so is size, small in Kehoe’s art, but size is not the same as scale. These paintings are as big as they have to be, which is to say that into them Kehoe has put everything she knows about painting. When the paintings click they fit perfectly in the viewers mind. 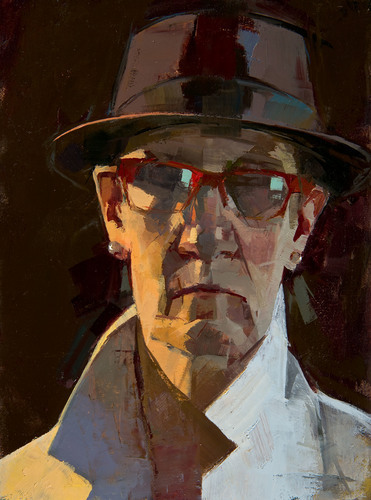 This essay will end, as Kehoe’s painting day does, with a look at Doctor K, as in “Doctor K’s New Hat” and a glance at the lab coat she wears when she teaches and in her studio. In most of her self-portraits Kehoe appears bareheaded. Her hair is short, utilitarian in cut. You can’t guess much about her style—her earrings are white dots and the frames of her eyeglasses unstylish—from her self-portraits, but “Doctor K…” is more forthcoming. She wears a porkpie hat and her lab coat’s collar is up at a rakish angle. Here I am, this portrait declares, ready for another day at the easel struggling with the objects I’ve arranged, ready to go wherever they, my brush and palette of colors, will take me.